Amanda Peterson was born in Rochelle, Illinois and did most of her growing up in Moriarty, New Mexico. She was bitten by the writing bug early: writing for school newspapers, contests, and plenty of stories that never saw the light of day. As an adult she has written Bible lessons for K-5th grades, newsletter articles, and devotional pieces. 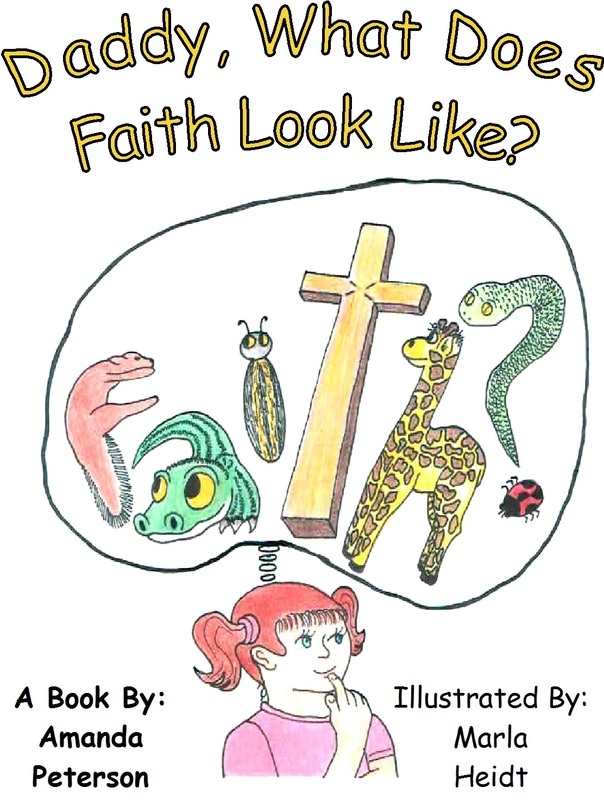 In 2009 she finally got serious and wrote her first children's book "Daddy, What Does Faith Look Like?" with the help of her awesome illustrator, Marla Heidt. She published Book 2 in the series "I'm Looking for God Today" in March 2013. Last year Amanda began writing Ladies Bible studies for a group she facilitates at a local church. She finished a series on the Proverbs 31 woman, which is slated to publish in 2013. She is currently leading and writing a study in James. Amanda, her husband, and their three girls live near the Chesapeake Bay in Maryland with three adorable kittens and one cranky old cat. The Proverbs 31 Woman intimidates most women. They think they can't measure up to her standards, and she makes them feel uncomfortable. Becoming a Proverbs 31 Woman teaches ladies about the characteristics of the Proverbs 31 Woman and how women today can learn to exhibit her characteristics in their lives. Ladies will learn, through studying several passages from scripture, that they can indeed change their lives and learn to live in the fear of the Lord. Becoming a Proverbs 31 Woman can be studied alone or in a group and includes plenty of room to write responses to questions and make personal notes. Daddy What Does Faith Look Like? This is a fun story about finding and recognizing faith in God. It's written from a perspective that will make sense to children of all ages, with rhyming verse and colorful illustrations so that even before they can read children will begin to understand the concept of faith in God. This book is written for parents whose children are starting to ask the "hard" questions about faith and what it is. "Daddy, What Does Faith Look Like?" answers the question in a simple format that children (and adults!) can understand and relate to. Sometimes the concept of God is difficult for children to comprehend: you can't see him, hear him, or touch him. This book takes children on a journey to find God in one little boy's life. Told in rhyming verse it's easy for all ages to understand and enjoy. This book is second in the series "Glimpses of God," a series dedicated to providing simple answers to complex questions of faith.